Before my trip to New York, I had noticed that the Bjork exhibition at MoMA was being severely criticised. As I really wanted my own perceptions to remain uncontaminated, I decided not to read any of the reviews so that I could come to my own conclusions. I believe this was a good position to take as I later found that the critics did not leave much room for manoeuvre of opinion about the exhibition. In fact, I actually found some things to dislike but also some noteworthy aspects to like. My main criticism relates to the fact that the exhibition is spread out along several floors of MoMA, with the result that it is not separated sufficiently for it to be perceived as something consistent and truly significant. A sector here and there spread out along the permanent galleries of the museum gives the impression of haphazardness and chance. On floor 1, visitors find the exhibition of a set of instruments used on Bjork’s album ‘Biophilia’ (2011) on which songs are played at different times throughout the day. Floor 2 houses two exhibits: ‘Black Lake’, a sound and video installation specifically commissioned by MoMA for the song of the same name from Bjork’s new album ‘Vulnicura’, and ‘Cinema’, a retrospective of Bjork’s music videos, from ‘Debut’ (1993) to ‘Biophilia’ (2011). Finally, on floor 3, visitors can find a timed ticketed show called ‘Songlines’, which presents a fictitious biographical narrative, co-written by Bjork and the Icelandic writer Sjón Sigudsson, and which unfolds the evolution of Bjork’s albums and characters through sound (via headphones), objects and images. The instruments exhibited on floor 1 are unconventional but I found no contextualising information about them. The sound and video installation ‘Black Lake’ exhibited on floor 2 looks as if it could have incurred a prohibitive cost without leaving a remarkable impression. In line with this, ‘Cinema’ displays a continuous loop of Bjork’s videos but adds nothing to them. Only the show ‘Songlines’, exhibited on floor 3, somehow sated my appetite as a museum visitor. It spans the first seven albums of Bjork’s solo career within an overall chronological flow throughout seven galleries. Nonetheless, it has been given an unreasonably insufficient amount of space, twisting tightly through narrow galleries, for the subject of Bjork to be properly tackled. If visitors are expecting a full explanation of the Icelandic musician’s work since she issued her 1993 breakthrough solo album ‘Debut’, they will be disappointed. So will those visitors expecting something comprehensive, like the remarkable ‘David Bowie Is’ exhibition. Rather, it is the audioguide discourse, which bears a great resemblance to Bjork’s own artistic approach, that is at the core of the exhibition. 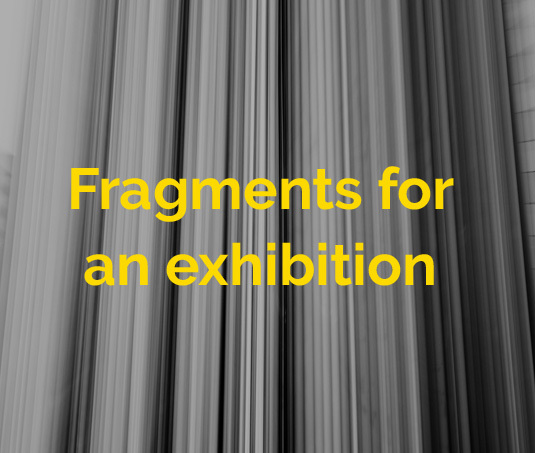 As I started moving through the gallery, I found myself thinking about the challenges that the exhibition poses in terms of the interpretative behaviour it asks visitors to pursue. The museum has long been fostering attitudes of public gaze by placing a focus on material culture and improving visitors’ knowledge by delivering a linear and instructive narrative; the Bjork exhibition, in contrast, is driven by an aural narrative, thus marking a shift in the role and meaning of sound in the museum. In addition, the narrative is not that of an expectable rational discourse, but rather an intertwining of biographical and fictitious events in Bjork’s solo career. Objects of material culture, mainly costumes and diaries, are sparsely exhibited so that visitors can be truly immersed in sound. 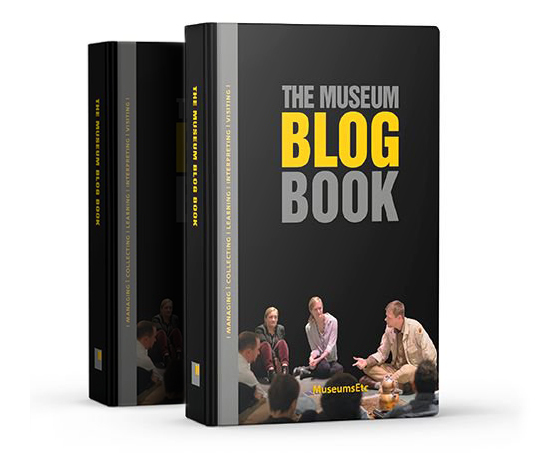 This drives visitors to take a huge step away from the inheritance of the visual/silence model of behavior, which has traditionally governed both cultural production and interpretation in museums. ‘Bjork’ is, indeed, a new format exhibition. From a certain point of view, the huge number of critics testifies to this, in that it specifically reveals a resistance to new practices of interpretation for visitors to adopt. ‘David Bowie Is’ has already explicitly exhibited sound as well but in no way did it deliver such an absence of objects of material culture. On the other hand, unfortunately, it seems to me that the ‘sound walk’ did not take advantage of its own opportunity and therefore somehow failed. It is an intertwining of a fictitious biographical text (‘The Triumphs of a Heart: A Psychographic Journey Through the First Seven Albums of Bjork’) and Bjork’s music. The text sounds like a poem. It is beautiful and the both the sound of the words chosen and the lady’s voice are amazing. The music engages the visitor and gives a setting for each album-themed gallery. On a global level, I found this exhibit reinterprets Bjork’s work although not from the perspective of how she has been publicly received. Nonetheless, its length renders it boring and forces visitors to prematurely skip to the next gallery. Put succinctly, I believe the objective was to deliver an artistic sonorous description of Bjork’s work for visitors to be immersed in, and to capture its cultural importance and relevance. Ultimately, with this approach, MoMA is aiming to disrupt the narratives of the so-called hegemony of the visual by building an alignment with Bjork’s own longstanding innovative approach. An interdependence of silence and sight has underlain visitors’ expected behavior in museums ever since the beginning of public museums. On the basis of this exhibition, it seems to me that there is still some work to be done, not only for museums but also for visitors and critics to learn how to benefit from looking at culture through the lens of sound. 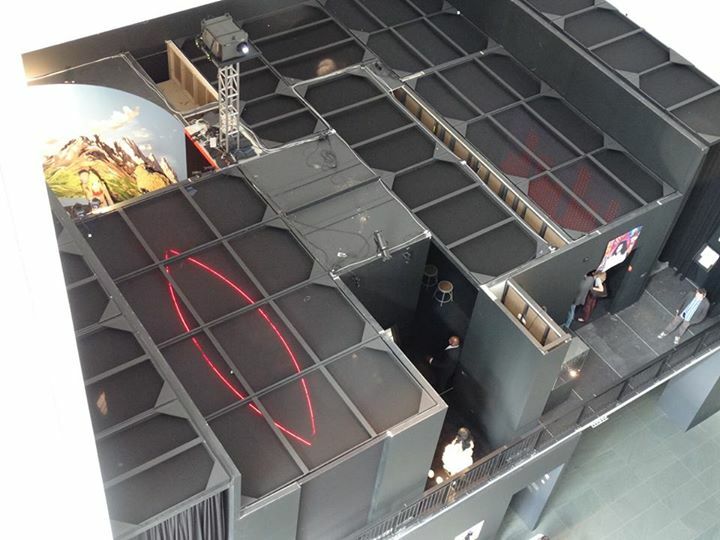 ‘Bjork’ exhibition seen from the above.